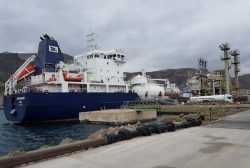 The Canadian-flagged vessel Mia Desgagnes, a new generation dual-fuel (liquefied natural gas and fuel oil) oil products tanker, last week received 424 m3 liquefied natural gas (LNG) as fuel at Spain’s Port of Cartagena. It is described by the Port as one of the most important bunkering operations carried out in the peninsula and confirmation of its positioning as a point of reference for loading LNG to ships. The LNG bunker was delivered by ten trucks at the dock, assisted by infrastructure manager Enagás, and supplied by Repsol and energy company Molgas Energía. It was the largest supply of liquefied natural gas (LNG) to a ship for use as fuel by Repsol to date. Repsol has been working to develop LNG bunkering solutions for customers since 2012, as part of the company’s commitment to innovation. In this line, LNG supplies have been made to ten different LNG vessels from several ports in Spain, including the first LNG supply from terminal to ship in Europe from a regasification terminal and the first cooling and supply for a LNG vessel. The Mia Desgagnes is the second of a series of four vessels with similar characteristics; it is made to measure according to an original concept developed by Desgagnés. It was built in the Besiktas shipyard in Yalova, near Istanbul (Turkey ) in December 2017. The vessel’s construction has been based on offering a safe and more environmentally friendly marine transport for petroleum products, well suited to the environmental controls in force in Europe’s coastal waters. Mia Desgagnés is a dual-fuel oil tanker whose most notable feature is that it can be powered by any of the three types of fuel: fuel oil, marine diesel or liquefied natural gas (LNG), which has undeniable advantages. In terms of sustainable development by drastically reducing greenhouse gas emissions, it is also the world’s first dual-fuel tanker endowed with the “Polar Ice 7” certification, which allows it to navigate in icy waters. Furthermore, it is equipped with its own individual equipment for the bunkering of LNG, which allows the vessel to receive LNG using up to 4 tankers simultaneously. This unique feature allows it to be efficiently fed in any port where there are cryogenic LNG delivery trucks. This operation joins the one carried out last year of bunkering pipe-to-ship that was carried out by means of flexible cryogenic hoses that connect the ship directly with the terminal. At that time, the ship Damia Desgagnés, of the same shipping company, received 370 m3 of LNG. The use of LNG as fuel contributes to the improvement of air quality. LNG is an environmentally friendly fuel because it does not generate emissions of sulfur oxides (SOx) or particles (PM) and substantially reduces the emissions of CO2 and nitrogen oxides (NOx), which makes it possible to comply with the more demanding environmental regulations and with the objectives of emission reduction.